Anorexia is a serious mental health condition and an eating disorder. People who have this condition try to keep their weight as low as possible in various different ways; such as not eating enough food or excessively exercising (or both). In time this can cause the individual to become very sick. It is important to remember that this condition can affect both men, women and children. However, it is most common in young females, typically starting in teenage years. 1.6 million people in the UK alone are affected by an eating disorder, 11% of these people are male. Eating disorders are more common in people between the ages of 14 and 25. 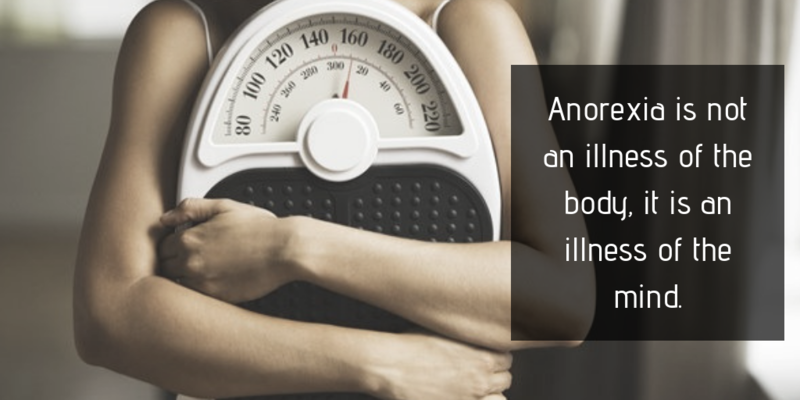 1 in 100 women aged between 15 and 30 are affected by anorexia. 10% of people affected by an eating disorder suffer from anorexia with 40% suffering from bulimia. If you or a family member has a history of eating disorders, depression, alcohol or drug addiction then you may be more at risk of developing an eating disorder such as anorexia. If you have been criticised by others for your eating habits, body shape or weight. If you have anxiety, low self-esteem or an obsessive personality, or you are a perfectionist, you may be more prone to developing an eating disorder. If you have been physically or sexually abused you may also be more likely to develop an eating disorder. There are various ways in which anorexia can present itself, so all cases are not identical, though they are likely to share similarities. Signs are split into three sections; behavioural signs, physical signs and psychological signs. Lying and saying that they have eaten earlier, or that they will eat later, or saying they have eaten more than what they have. Not being honest about the amount of weight that they have lost. Taking appetite suppressants such as slimming or dieting pills. Social withdrawal and becoming isolated. Irregular periods, or periods stopping altogether (for women). Feeling cold or having low body temperature. Swelling in feet, hands and/or face. Underestimating or denying the seriousness of the problem. Fear of fatness or pursuit of thinness. Excessive focus on body weight. Distorted perception of body shape or weight (thinking that they are bigger than what they really are). Anxiety about eating food in front of other people. Perfectionism and setting very high standards for themselves. Other mental health conditions such as depression, anxiety or obsessive-compulsive disorder (OCD). It is important to seek help and support as early as possible as this will give the individual a better chance of recovery. If you think that you might have anorexia, go and see your GP as soon as you can, even if you are unsure. The doctor will ask questions in regards to your eating habits and your feelings towards food and your appearance. They will also check your overall health and your weight. It is possible that they will take some blood tests to make sure that any weight loss that you have encountered is not due to a different underlying problem. If the doctor thinks that you do have anorexia they are likely to refer you to an eating disorder specialist or a team of mental health professionals. It can be difficult to admit that you have a problem, if it makes you feel more comfortable, you can bring a friend or family member to your appointments for support. If you are concerned about a loved one, talk to them, express your worries in a kind and caring manner and offer to go to the doctors with them, let them know that you are there to support them. It is possible to recover from anorexia, though this could take time and recovery will be different for everyone. A treatment plan will be tailored to the individual needs of the person with the condition and they may be referred to further support sessions for other mental health conditions such as depression, anxiety or obsessive-compulsive disorder. If you are under the age of 18 you may be offered family therapy as well as CBT or adolescent-focused psychotherapy to help you on your road to recovery as well as supporting your family members through the process. Problems with muscles and bones including feeling tired and weak, osteoporosis and problems with physical development in children and young adults. Heart problems and blood vessel problems – including poor circulation, irregular heartbeat, low blood pressure, heart valve disease, heart failure and swelling in the feet, hands and face (oedema). Problems with the brain and nerves – including seizures and difficulties with concentration and memory. Having a weak immune system or anaemia. Anorexia can put your life at risk, it is one of the leading causes of death related to mental health conditions. This could be due to physical complications or suicide. Having an eating disorder is nothing to be ashamed of, it is an illness like any other and you deserve to receive help, support and guidance. Please speak to a GP if you think you may have an eating disorder, the sooner you receive help the better chance you have at fully recovering.